Most corporate enterprises make use of call centers to interact with their potential target market. The count of such examples is endless ranging from; customer support to mailing and fulfillment. With call centers operations expanding some entities even opt to manage their internal functions and routine tasks like technical support and help desks through it. Businesses even service internal functions through call centers. Examples of this include help desks, retail financial support, and sales support. In such organization managers are the best sales agents of the firm. They serve in the front line and take to problem resolution, communication, satisfying and sales of any product or service. Hence, knowing what are the stronger areas of the firm is as important as knowing where businesses are slacking from. To best combat this challenge Balanced Score card come equipped with solutions and tools to measure, plan, control, device the performance agents using its unique set of metrics. It can be used along the hierarchy of organization assisting the lower level management with performance measures and the high level with a viewpoint from varying angle that will help satisfy the stakeholders to the maximum and provide a clarified view of the operational tasks within an organization. The operations, activities and tasks within call centers are defined using number based scoring system. The widely arrayed task ranging from promotion to post service poses challenges of the management that relate to technology and staffing field. It is of high concern that organizations develop an adequately powerful knowledge-pool about the various aspects involved in customer service to aptly resolve the concerns that keep springing up now and again. 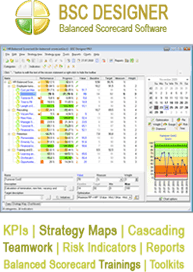 Structuring relevant KPIs (Key Performance Indicators) on scorecard helps in tracking the potential areas in the form of indicators to which ‘target’ and ‘actual’ values can be assigned. These metrics that can be incorporated and related to the levels that need to be studied in a given circumstance. The operations within a call center are dependent on two types of calls namely; inbound calls and outbound calls. Inbound are the ones that are done by customers for having information about the operations, thereby giving it the shape of help-desk. Outbound calls, however, are made to people for the purpose of selling or promoting products or services to them. These two categories with numerous tasks assigned can be managed better with the help of scorecards. Balanced Scorecards also offer ideas of presenting that are appealing and logical. For example its use of stop lights which are indicated as a red, yellow or green triangle and appear next to the metrics that require attention, which can be adjusted according to specific performances and turned off as well. These spot lights can also be used in the reports for the purpose of data communication. This allows data to become easy to be tracked and comparable against defined measures of calculation.